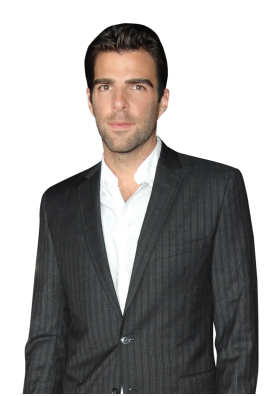 Former Heroes villain, Zachary Quinto has come out of the closet and he did it about as low-key as you possibly can. No big front cover interview. He was actually talking his roles and a lot of politics with New York Magazine when he slipped in the words “as a gay man” and that was it. Quinto didn’t want a parade or a big spotlight on it. He just put it out there and left it. Right. How much do you encounter projection personally based on the roles you’ve played? Tons and tons and tons. I think because both of the characters I’ve become most associated with tend to be pretty iconic in nature, archetypal, there’s a lot of expectation that comes from people. Those projections are really just — they have nothing to do with me, so it’s been an interesting road to navigate. I was on TV for four years and I was coming into peoples’ homes, so there’s a familiarity that people tend to have, which can sometimes be jarring or borderline off-putting to me because I’m not really — I’m a pretty low-key person in general, so sometimes I get jolted out of my own path or my own thoughts by someone on the street. You lived here when you did the play Angels in America, right? I was here for a year. We did Margin Call, I wrapped Margin Call, I started rehearsals for Angels in America two days later. It was incredible. It was the most challenging thing I’ve ever done as an actor. And the most rewarding, hands-down. I had not been on stage in six years and so for me to do my first play in New York and to have it be this epic masterwork that, you know, went right to the heart of so many matters that were and still are circulating both in society and in my life personally, it was an enormously rewarding and terrifying journey for sure. Just the sheer scale of the play to begin with. And then I just think revisiting that work and revisiting the themes of that work at a time when the political and social climate of the country is shifting so dramatically and so irreversibly, to really come up against the echoes of that hatred and that bigotry and that fear that still exists in our culture, just in a different context now — you know, I feel it was just a really interesting exploration for me. Doing that play made me realize how fortunate I am to have been born when I was born. And to not have to witness the decimation of an entire generation of amazingly talented and otherwise vital men. And at the same time, as a gay man, it made me feel like I — there’s still so much work to be done. There’s still so many things that need to be looked at and addressed. The undercurrent of that fear and that, you know, insidiousness still is swarming. It’s still all around us. To revisit that world at all, it took a toll on me. It definitely was an incredible experience but it was really daunting at times. Read the full interview and hear Quinto’s thoughts on Occupy Wall Street HERE.